Any business owner knows that the more people you get to visit your store or browse your website, the more likely you are to make sales. 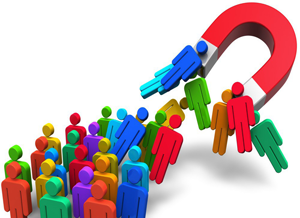 However attracting customers to begin with can be a difficult task. No amount of marketing is going to pay off in the long run if your service or product is simply not that good. Word of mouth is still one of the most powerful tools at your disposal, and the only way to get people talking positively about your business is to make sure your current customers have the best possible experience. In the online realm this involves promptly answering email or social media queries, following up to see if the customer is still satisfied, offering continued support and perhaps even coupons and discounts for being loyal. The rest is just common sense… meet deadlines, dispatch products quickly, have a simple returns or refund policy etc. Here are 4 other methods to attract customers to your business in 2016. In 2016 the one thing the public can’t stand is being sold something. So where does this leave small businesses? The truth is people still want to buy products and use services, they just want to be reassured that a real person is behind the business and are being honest. This means you should cut down on your sales-speak and engage your customers/potential customers like a community. This is especially true on social media platforms like Facebook and Twitter. The difference between somebody buying from you or the competition may come down to whether they like your personality in a post. Some people think that signing up to all of the big social media platforms and making a few posts is enough to attract customers. However to attract customers consistently you need to post regularly, keep your site updated, and share information not even directly related to your business but that your customers will find interesting. One of the reasons many people get lazy with their online presence is because they already have day to day commitments in other areas of the business. A good way to get over this hurdle is to hire a professional internet marketing company to handle all of your accounts. Whether your business is online-only or you have a site that serves as a marketing tool itself, the only way it will take off is if people can find it. One of the primary drivers of online traffic is search engines, so it is important to optimize your site for relevant keywords so it will show up high in search results. It also needs to have quality content that real people would want to read and will find valuable. One method that has been attracting customers since the dawn of business is the special offer. Call it a psychological trick or a thank you, but temporarily knocking down your prices, offering an extra gift, or running a rewards program, is always a good way to get people to take notice. In the age of social media you can also think outside the box. How about the following idea? The customer gets a discount and promotes your business at the same time. What other unique promotional methods can you think of?